One, I like to cook. Two, it is WAY cheaper than buying it at the store. Organic is not a big deal to me, but saving a dollar or two sure is. From a one dollar bag of frozen green beans I was able to make 10 – 2 oz jars of puree! When I saw that one jar can cost at least that, I was pretty impressed. 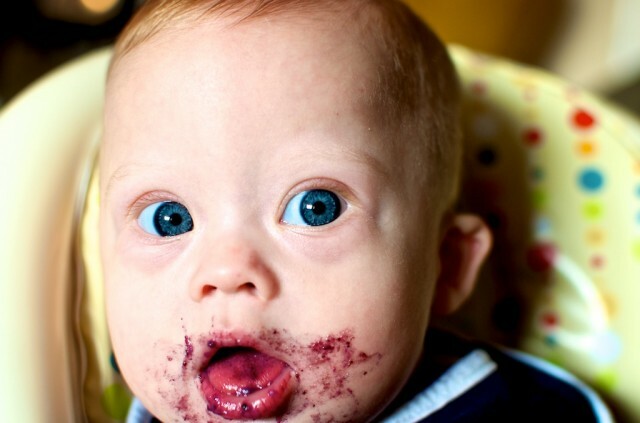 Organic is however important to my friend Rachel whom has quite the cutie who also just happens to have Down syndrome. We met through our local down syndrome support group and it has been great going on this adventure together. 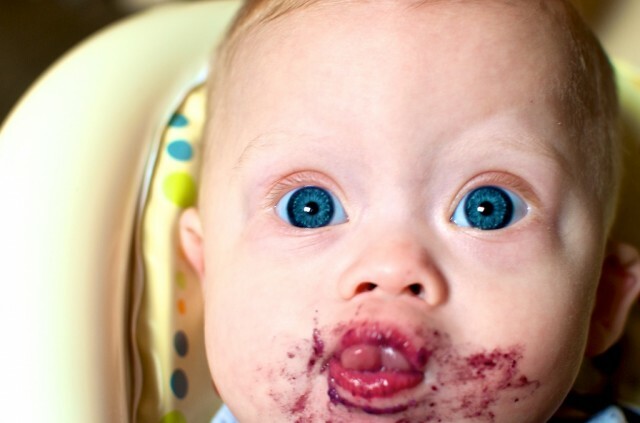 She has two great blogs, one about her kiddos and the other about making your own baby food. This is where I have gotten all of my recipes and figured out what food to offer and when. I have the page bookmarked and have been working my way through all the choices. I have been using some cheap individual baby food containers, and they have worked great. I like that they are individual and not the ice tray version as I can get it out, thaw it and then use it to feed from. She told me about getting the glass mason jars at the store with the plastic tops, but I haven’t gotten those yet. Reserve liquid and use a slotted spoon to transfer blueberries to blender/processor/mixer and puree. *You can save the liquid to serve as juice or to blend in with cereals etc.. Thanks for sharing and for the link to your friend’s blog. We can’t wait to start making food for Lilah in a couple months. Take care! No problem! 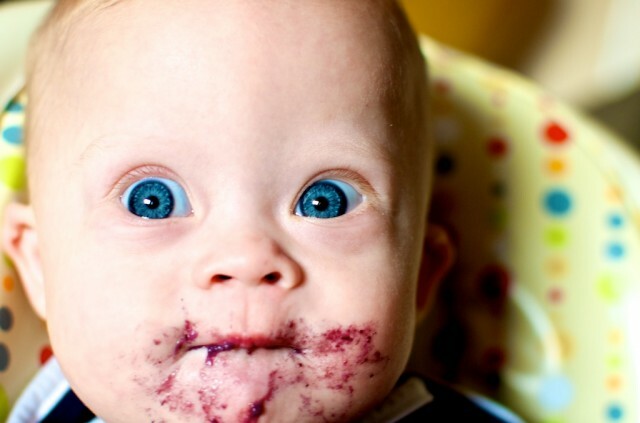 Be sure to fill us in on your baby food making experience once you start! I just wanted to say thank you for all your info on these blogs! 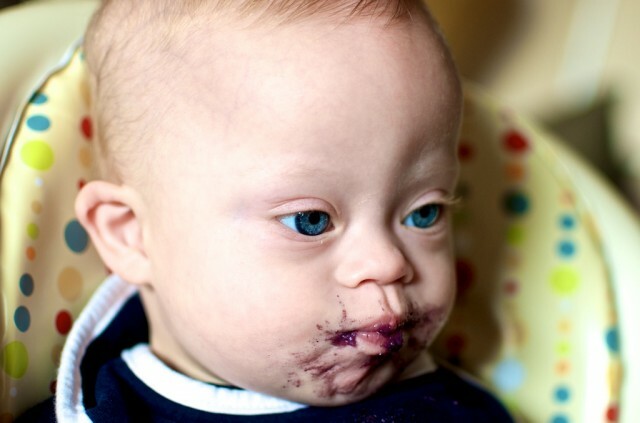 I am new to all of this, my son is 14 weeks old and has Downs. It gives me a lot of smile seeing Noah and some of the things I can look forward to in the future. Thanks! Congratulations on your baby boy!!! I know it can seem overwhelming at first, but I assure you things calm down. We are glad to be on this journey with you. So I am planning to write something about Down syndrome daily on my (craft) blog to raise awareness, to ‘celebrate’ Down syndrome awareness month. Some time this month I would like to link to your blog, and specifically the post where you write about the fears that never came true. Just checking to see if you’re OK with that. If possible, I’d like to use a picture, too, maybe the banner on top of your blog, but I would like to have your permission to do so prior to that. Hey! I’m so sorry I’m just now getting to this comment. I’m not sure what happened…I normally try to replay pretty quick.